South Bend, IN. 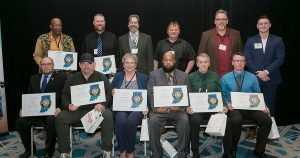 March 19 — Stay Metrics, the leading provider of driver retention tools, announces that the number of drivers who received the Indiana Motor Truck Association’s Master Truck Driver (MTD) Award in 2019 — the first year of program sponsorship by Stay Metrics — increased by more than two-fold, year over year. Stay Metrics’ Scott Witcher (back row, far right) poses with the Master Truck Driver award recipients at the SMC Award Banquet. The IMTA Master Truck Driver Award program recognizes top drivers in the trucking industry for their professional excellence in service and safety. For 2019, the association waived the application fee for carriers due to the support of IMTA Allied Member Stay Metrics, who provided recognition kits for the program that included framed certificates, window decals, and other items with IMTA MTD logos. To qualify for the IMTA Master Truck Driver award, drivers must have at least one year of tenure at their nominating company, a clean Motor Vehicle Record for the past 3 years and achieved either one million DOT preventable accident-free miles or 10 years of DOT preventable accident-free driving. Drivers must also have one of the following: completion of a Professional Driver Improvement course; a record of community service; participation in any state or national Truck Driving Championship; or performance of a heroic act. Scott Witcher, Senior Client Relationship Manager, and Keith Sayer, Marketing Specialist for Stay Metrics, presented the MTD Award packets at the IMTA SMC banquet. To learn more about the IMTA MTD Certification Program and to nominate a driver, visit: https://www.intrucking.org/award-applications.html. Nominations are accepted all year long. Stay Metrics helps motor carriers realize Retention. Not Regrets. Its industry-leading retention toolkit includes onboarding, exit, and annual satisfaction surveys as well as a fully featured online rewards platform. Robust reporting tools, targeted driver intervention opportunities, and insightful client support teams all give carriers actionable data on what is causing turnover in their driver workforce and what changes might reduce it. These tools help drive down expenses, foster fleet growth, and improve the lives of drivers. Stay Metrics is based at Innovation Park at the University of Notre Dame in South Bend, IN, and was recently named a “Best Place to Work in Michiana” by the South Bend Tribune. The Indiana Motor Truck Association is a highly respected association that strives to serve, represent and promote the interests of the trucking industry by enhancing its image, efficiency, and productivity through its focus on safety and advocacy. Founded in 1934, the IMTA has continuously offered safety programs through its Safety & Maintenance Council, including distracted driving education, advocacy at both the state and federal levels, networking opportunities, and free consultations for its members. For additional information, visit intrucking.org.